Saffron, the true Red Gold! Saffron is often referred to as the “Red Gold”. One of the main reasons would be that Saffron is the most expensive and delicate spice in the world. Next to the culinary function it has for many centuries, Saffron is also very important in the Pharmaceutical industry. Roco Saffron is proud to be currently working on a project in the U.S.A. sourcing Saffron bulbs and Saffron assisting to find a cure for some different Cancer types. Saffron is also proven to be a strong anti depressant. Some experts say just a little bit of Saffron has the same effect as Prozac. During on of our visits of one of the biggest professional Saffron grower in Spain we found out why the name “Red Gold” made very much sense to us. The biggest Saffron production in Spain is by far in the region ‘La Mancha’. The area of La Mancha in Spain is known for Don Quichotte but also for producing a first class quality of Saffron. The region of La Mancha mainly depends on the Saffron production as a main source of income. The yield of Saffron depends on a yearly basis, depending mainly on weather conditions. As soon as there is less supply on the market of Saffron the price per kilo tends to rise quickly. Our customer told us that many people hold Saffron as their pension savings. One of the main characteristics of Saffron is that it can be kept for years under the right storage conditions. As soon as the price tends to go up due to a shortage of supply on the market, people literally take their Saffron savings and sell it on the market. Once, a very old lady brought in Saffron from her savings wrapped in a newspaper. The date on the newspaper indicated that the Saffron has been saved for quite some years. 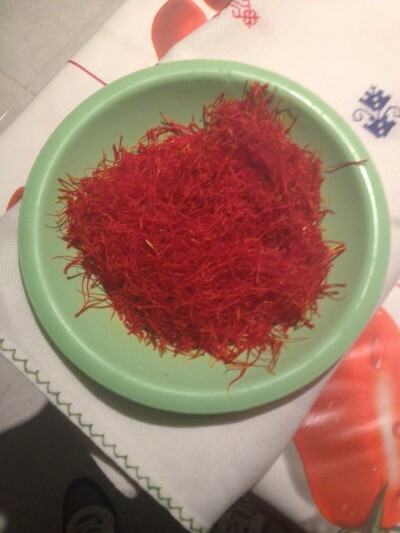 Some experts say that the older the Saffron gets, the more intense and stronger the taste of Saffron becomes. No wonder this delicate spice is also referred to as the “Red Gold”! No spice exudes luxury and quality much like saffron. The fragile threads are central to the fragrant Spanish paella, rich Indian curries and steaming Moorish dishes. Saffron has been used for over 3,000 years and in all that time colored state dinners of the royal houses of many great civilizations and filled with its pungent aroma. The spice we know as saffron is extracted from the saffron crocus (Crocus sativus), mainly grown and produced in countries such as Iran, India, Spain and the Netherlands. This beautiful purple flower is very delicate and can best be harvested early in the morning by hand. The flour is then, again manually, pulled the three long stigmas: the saffron. The pistils only the upper, red, portion is of value. After the harvest the stigmas are dried and then lightly toasted. The latter is very close, a brief inattention can already cause is lost to saffron's thousands of Dollars. For one kilo of Saffron to be harvested saffron, about 100,000 to 150,000 flowers are needed. 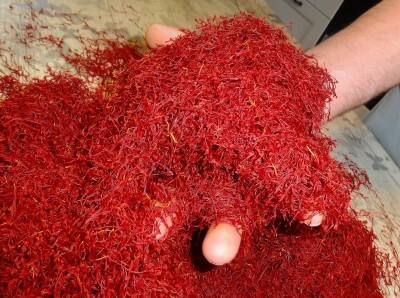 This and the labor-intensive harvesting and processing ensure that saffron is the most expensive spice in the world and also called the "Red Gold". The total World production of Saffron is estimated to be approximately 20 tonnes per year. The price of up to € 8,000 per kilo makes this spice the major obstacle to use saffron in the kitchen. However, saffron is very powerful and only very small amounts of food necessary are needed to give its typical business card. Because of the high price there is unfortunately very much messed with saffron. The coloring of stampers are improved by adding safflower or turmeric. It is therefore advisable to buy instead of powdered Saffron, whole saffron threads. Please ensure that the threads of Saffron have a nice red color. The darker the color, the higher the quality! A dark color, light and humidity and good elasticity indicate a good and fresh stock of Saffron. Cheap saffron does not exist, if you do intend to take on this is a sign that something is not right. Using Saffron gives a very rich, warm taste and smell of food that is both powerful and subtle. The taste of saffron is reminiscent of honey and is also slightly bitter. The intense aroma of saffron is unmistakable and is warm and soft but also firm and even a little muggy. Saffron also gives off a yellow-orange color when it is added to food or liquids. You only need very small quantities of Saffron. Go in normal use, from about three punches per person. It is easy to use too much, which may lead to a very predominant odor and flavor. Key Indicators of premium Saffron and ensure the best Quality! To start with a good and healthy crop of Saffron the most important is the source of your Saffron bulbs! Make sure to source the highest quality source of Crocus Sativus bulbs! The darker the color, the better the quality. Saffron can be hold for years, and the taste becomes even stronger & intense. It is proven that Saffron has many benefits to your health and mental condition! For any questions about growing Saffron bulbs, please contact the experts at Roco Saffron! Roco Saffron counts on many years of experience in the Saffron industry and shipping wholesale Crocus Sativus Bulbs worldwide! Growing Saffron starts by acquiring a premium source of Crocus Sativus Bulbs! In case you have questions please do not hesitate to contact Roco Saffron for further advice! Roco Saffron has started many professional Saffron Growers in the past from scratch!